I found the problem, it didn't have relation to the i2s module. There was an error compiling bcmdhd module for wi-fi. 1st off all thank you for your sharing. I'm interested to make CT able to play with audio for metering, recording, and study. My 1st goal have been Jackd and ardour working perfect after a long session of source code compile directly on the CT.
With obiouvsly not much filter applied at same time I can use them without have any xrun errors and re-patch audio output to headphone with nice audio quality. No pop, no glitch, no artefacts. I would like understand which kind of possibilities of audio input can we use with CT.
For analog to be honest I've not yet found the right config but changing script.bin I've made alsa able to have all inputs visible on alsa mixer (various mics, line IN, line ADC, etc...). Jackd can route input (analog noise around -60db -50db of TP). I've not connected nothing yet to the right jumper. did you experts had some experience about i2s input or only i2s output? do you have some ideas to have digital input, maybe also more than 2ch please? Maybe with also something like AES/EBU to i2s and so on. much appreciated any your answer. apologies for my rough english. How is the multichannel output in i2s driver, is it supported? The patch seems to enable all SDOx output data pins, but guess that is not enough. How difficult would it be to patch the SPDIF sources?? SPDIF still doesn't come with 24bit, which is a pity. I looked a little bit into the SPDIF code and into your patch . (I'm not an experienced programmer.) A lot of similarities. I guess it shouldn't be too complex to get SPDIF up 2 24bit. 24bit is IMO more important than having high samplerates All high samplerate material is 24bit anyhow. So 24bit comes first. I set CONFIG_SND_SUNXI_SOC_CODEC=m with make oldconfig. Anything else I'd have to consider? I changed the module config to "Y" now with menuconfig. Compiled again. nikkov, what's there beyond clock source fix you've posted in the beginning? I attached new patch for I2S. 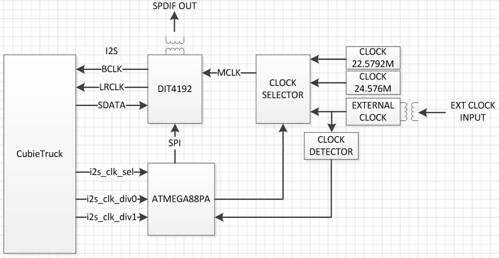 What can you say soundwize regarding using your 2 clock solution vs "only" using the internal clock for bit-perfect I2S on 44.1KHz and 48KHz (and multiples)? My current setup suitable only for code testing. So I can't compare sound quality. But I know that sound from clock derived from PLL potentially lower quality. First post here. Good work for enabling I2S. It seems the patch requires compilation of the source. Is there hope for those of us code-challenged to have this incorporated into a release? There's nothing criminal in compiling the code, there are several toolchains ready-to-go, from linux packages to even Mac OS. One day of pain, and you're in control. In any case, you need to brush the kernel seriously for best audio results. I have removed tons of unused stuff, shrinking the kernel 6x in size. any idea how to send 24/96 stereo through usb dac? It plays mp3, but does not play flac. 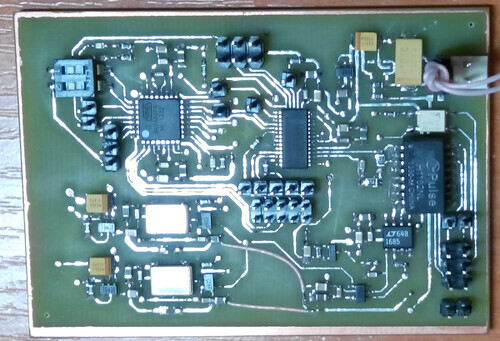 In our A20 custom board we are using i2s sound card , for that we are using TI external codec TLV320AIC3100. In Kernel tree we have alsa driver for TLV320AIC3100. So i tried by writing Asoc machine driver linking alsa external codec to sunxi-i2s soundcard and compiled successfully and by insmod also working fine.but once i play any audio which is not yet worked. My i2s soundcard is working fine, i am getting mclk,bclk but not able invoke the dac. Kindly help me. How can i solve this. Sorry, I have no experience developing drivers for linux, but in your case may be need check codecs initialisation code and working I2C control bus? And I checked only I2S mode, PCM mode not tested!